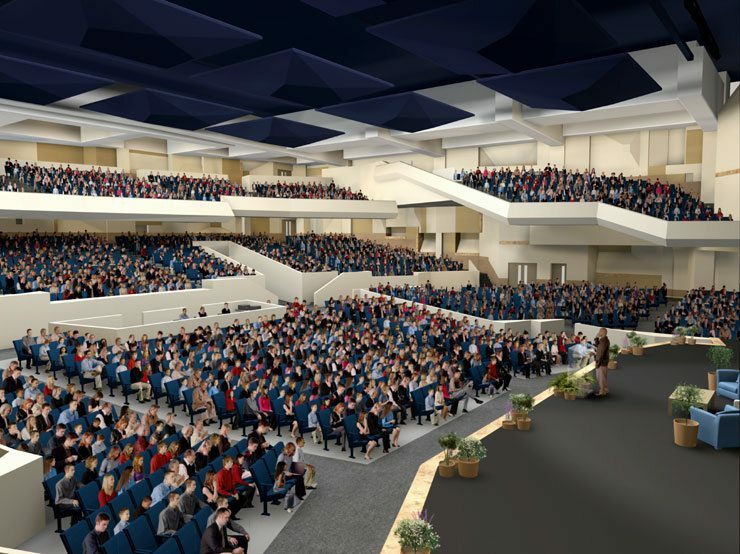 Artist rendering of interior to Rock Church, able to sit 3500. The class action suit against McMillin properties proceeds this Friday, May 13th, 2011, before Judge Richard A. Strauss. Judge Strauss will determine whether McMillin had a duty to disclose the potential relocation of the Rock Church, a “mega church,” to purchasers in the Point Loma residential community of Liberty Station. The case entitled Mann v McMillin was certified as a class action by Judge Strauss on December 3, 2010. McMillin entered into negotiations with the mega church in early 2002 to sell it a 250,000 square foot structure, described by Pastor Miles McPherson as being akin to the mythical size of Noah’s ark. The Rock planned on utilizing the massive structure to seat 3,500 people and on holding 5 services each Sunday, thus subjecting the small residential community of 349 homes to up to 17,500 parishioners each week, along with thousands of cars. Kimberly Elliott, a McMillin Vice President, wrote in 2002 to pastor Miles McPherson that because the relocation of the Rock Church was “so politically sensitive” it would be better for “you and us”not to disclose the relocation to the public. The Church opened its doors in Liberty Station in August 2007. A contemporaneous letter exchanged between lawyers for the Rock Church and McMillin reveals that McMillin and the church have “agreed to disagree” about whether McMillin promised the Rock adequate parking at Liberty Station. McMillin advertised the residential neighborhood carved out of the remains of the Naval Training Center as being “for people, not cars” while at the same time clandestinely working with the Rock Church to relocate to Liberty Station. An expert for the plaintiffs has opined in a written declaration filed with the court that McMillin had a duty to make full disclosure because the relocation of the Rock Church to Liberty Station could have had, and plaintiffs now claim, has had, a material affect on the desirability and value of their homes. McMillin did not file an opposing expert declaration. On a side note, critics view the City of San Diego’s “sale” of NTC to Corky McMillin Properties as one of the greatest public land give-aways to private developers in modern San Diego history. All I know is, it’s a NIGHTMARE to do any shopping, i.e., Trader Joes, Vons, on a Sunday. I avoid the whole shopping center like a plague on that day!